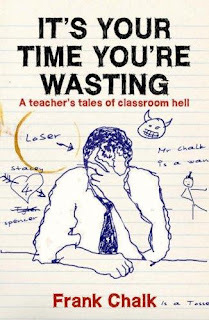 It's Your Time You're Wasting by Frank Chalk follows a teacher through a year at the school he works at. Frank Chalk is an ordinary teacher in an ordinary British school. A school where the kids get drunk, beat up the teachers and take drugs - when they can be bothered to turn up. I initially picked this book up because I was drawn to the cover and the title, and I wasn't disappointed! I thoroughly enjoyed listening to this book on the kindle.